Living as We: Birmingham Chocolate: Review and Giveaway! This household loves chocolate! I would say that chocolate is one of my favourite guilty pleasures. I recently came across Birmingham Chocolate. Birmingham Chocolate prides themselves on providing high quality chocolate temptations, specially hand-crafted by their chocolatiers for you and your family. They work with white, milk, and a wide variety of dark chocolates. With so many health benefits, the dark chocolate tend to be a customer favourite! I was sent a fantastic package filled with lots of goodies! The pieces that stood out most to me were the chocolate covered oreos, the chocolate covered pretzels, and the solid milk chocolate bar. This was my first time eating a chocolate covered oreo. It was covered in dark chocolate (which in all honesty, I'm not a huge fan of), so I was a little hesitant. I have to say though, it was my favourite out of the bunch! I had one and just had to share the other with my special someone. Needless to say we both wanted more, so we will definitely be keeping those in mind for special occasions. The chocolate covered pretzels came in a package of three. One white, one milk, and one dark chocolate. I thought it was neat to taste the differences between the three. It was a good mixture for anyone who loves the salty and sweet combination. The solid milk chocolate bar was probably the creamiest chocolate I've had in a long time! It melted so nicely on the tongue, that I couldn't help but wonder what it would taste like in smores. Even with all of the health benefits of dark chocolate (lowers blood pressure, reduces risk of stroke, helps control blood sugar), I am still not a big fan. That's just a personal preference though. So, I had a few others try the dark chocolate bars, and the award winning ganache chocolate truffles that were sent along. Their reactions were great! Everyone loved what they tasted, and dug back in for a second and third bite. I heard comments about how unique and different their flavours were compared to most other brands. Overall, I appreciate that the folks at Birmingham Chocolate have a little something for everyone. They have vegan, sugar free, gluten free, and kosher treats. They seem to have something for every occasion, whether you are looking for unique wedding favours, a delicious Mother's Day gift, or that special something for a fundraiser you are planning. They also don't use preservatives, so you never have to worry about what you are consuming. We thoroughly enjoyed each and every bite and will be keeping them in mind for in the future. Connect with them on Facebook, Twitter, Pinterest, and Etsy. Doug, the head chocolatier from Birmingham Chocolate, has offered up a fantastic prize for one lucky Living As We reader! 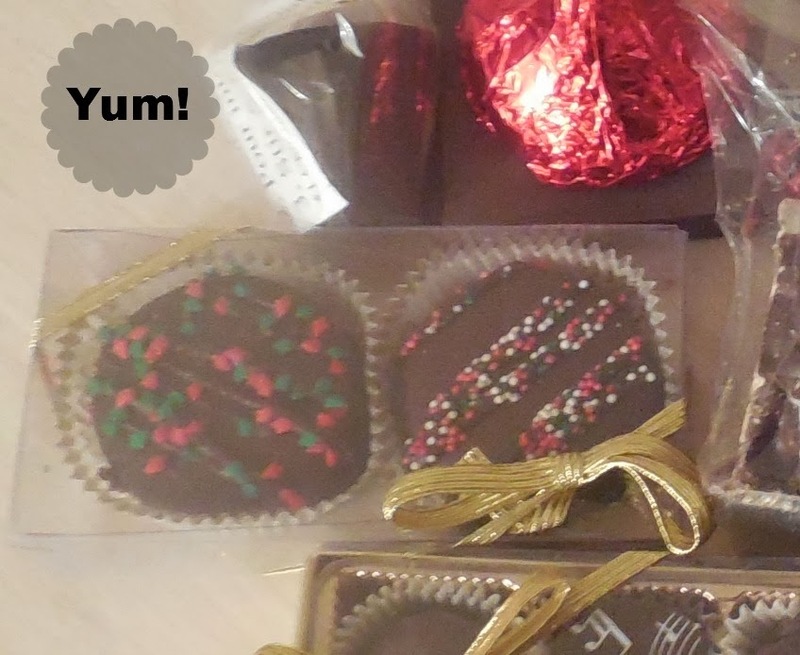 Prize: One winner will receive a gift basket filled with some amazing chocolates! (ARV $110, prize not exactly as shown). Eligibility: US/Canada, 18+ (excluding Quebec). I would love to try their Cheesecake Ganache with White or Milk Couverture Truffles. Yumm! The Jamaican Rum Ganache with Dark Couverture sounds so good!! I'd love to try the extra large platter. I think the pretzels on that tray look great! I would love to try White Ganache with White Couverture, looks great. 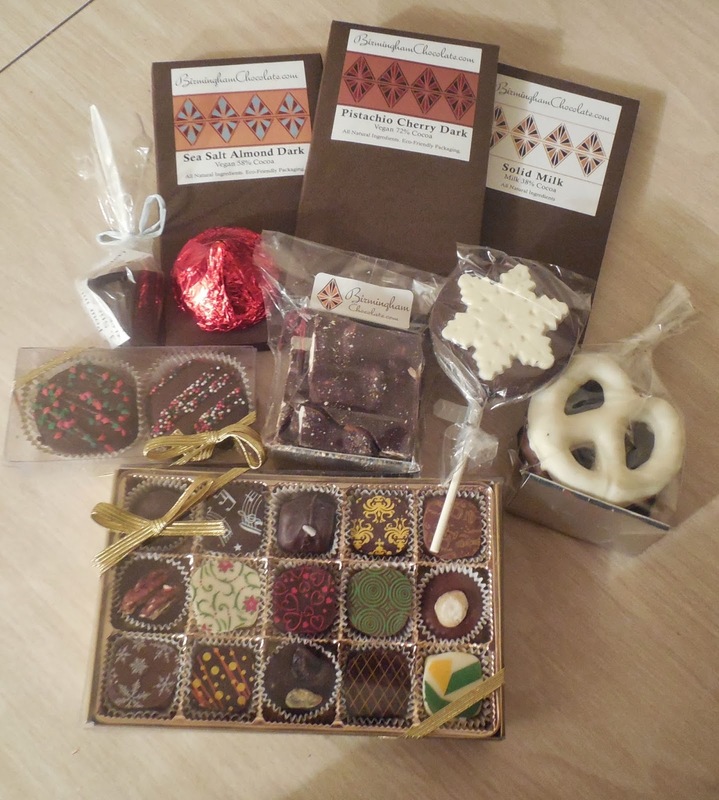 Mmm, the assorted truffles and chocolate covered pretzels.... sounds SO good. I love they support so many organizations in the community. It's quite the list! I'd love to try some cake pops! I like their "trays of Treats"
I'd love to try the Grand Marnier Dark Ganache with Dark Couverture. I want to try their Hazelnut Pralines. Just the name makes me drool. Truffles are my weakness and the Cheesecake sound so good! I would love to try the truffles! And they are hand made! I want to try their Hazelnut Pralines, they look yummy. I would love to try their trays of treats! The truffles look amazing! I would love to try the Cheesecake Ganache with White or Milk Couverture. I would love to try the cheesecake ganache! Yummy!!! I would LOVE to try the Hazelnut Praline~! I would love to try the solid milk chocolate candy bar! Loved the musical chocolate piece in the Small Heart Box. So cool looking! And the Oreos sound delightful!!! Loving that dark ganache truffle! I like how much they support their community . i love the large dark chocolate basket for mother's day. I love to try either of the Cheesecake Ganache with White or Milk Couverture! Oh yum! I'm intrigued by the Sweet Basil truffle since I've never heard of that combination. But I love chocolate and like basil, so I'd try it. whoa...they have a chocolate club! 'Club Chocolate'! is my kind of club. I would like to try their Large Deluxe Heart Box! It looks so good! I like that they offer the custom baskets in small, medium or large. I'd like to try the Lavender truffles. Sounds like an awesome company - I love that they're so involved in the community! I like the Almond Sea Salt Dark. I would love to try their Truffles. the cheesecake ganache truffles sound amazing, my mouth is watering! I would love to taste their truffles! I like the Boxed assortment. Those pounder pretzels look delicious, but then again so does everything! I like that their products are made fresh on site. Their milk, dark and white chocolates are gluten free. They are certified kosher dairy for chocolates, gelato and drinks excluding the Sabbath and Jewish holidays. Their dark chocolate is completely free of dairy ingredients and they carry several vegan products. And, they carry sugar free bars in four different flavors with all natural ingredients. they have a beautiful assortment and I would love to share this with my family, YUM! I learned that chocolate tasting, much like wine tasting, is an art of itself. I never thought about chocolate having three stages of taste either. I am going to have to pay more attention next time I enjoy some! this makes me really interested in the assorted truffles they make. I would love to try their Blueberry Nibs Chocolate Bar and several of their truffles! Like the Wedding ideas. As my son is getting married soon. The bride and groom in chocolate is cool. The Hazelnut Praline sounds yummy. Well all of it lol but I'll say truffles! I like that they are homemade. I'd love to try their truffles! The Urban Farming bar looks like a real treat! Thanks for posting this giveaway to my weekly giveaway linky (http://www.journeysofthezoo.com/category/giveaway-linky) where everyone is welcome! I would love to try the Milk Couverture Truffles. I'd like to try their cake pops. Everything looks mouthwatering here Sarah and I love that Birmingham Chocolate's offers vegan versions. Lovely gift ideas!! i would love any of their products. their message chocolate bars look really fun tho. i'd want to try a chocolate covered oreo. yum! I love the chocolate trays! they would be great for parties! I love that you supply favors for events such as Weddings. Wow! Would love to send their large Easter baskets to my Grandchildren. They look delightful. I'd like to try the Milk Chocolate Cashew Cluster. The chocolate covered Oreo sounds amazing. I'd like to try their Grahams Dipped in Dark or Milk Chocolate. I'd love to give their Cheesecake Ganache with Milk Couverture a try! Oh man they look amazing! I love the presentation of their chocolate basket! and I would love to try the Macadamia Chai chocolate bar!! I would like to try the blueberry nibs! Cheesecake ganache truffles, seriously !!! That's heaven right there. The Coconut Haystacks look like really fun sweets, love the uniqueness! The Carmel Pecan Bark look and sound amazing! hmmm I want to try the almond cluster,,hmm it all looks soo yummy!! Id love to try the Carmel Pecan Bark. Thanks for the chance. I have such a weakness for Maple!! And the Butterscotch with Dark, Milk or White Couverture sound delicious too. They have Italian Gelato....AHHHH! The apricot one sounds lovely. I would love to try their peanut butter cups, because I am obsessed with peanut butter! I would also love to try Oreo Bark! Id love to try Chipotle Ginger Semi-sweet Dark Chocolate Bar. So much goodness!!! I really like the Place Settings : Imprint names into fine chocolate so your guests not only know where to sit, they have a sweet treat at their seat. - it's a two in one deal,.. I would love to try the Macadamia Chai Candy Bar! I would like to try http://www.birminghamchocolate.com/shop.html?page=shop.product_details&flypage=flypage.tpl&product_id=76&category_id=6 I think it looks so good! I'd love to try their caramels! I love that a lot of their chocolates have a vintage look to them. I'd like to try the Manitou Chai Dark Ganache. I could go for some oreo bark. I'd love to try the Large Truffles Box. I love the chocolate high heel shoes! I'd love to try the Hazelnut Praline! The Pretzels wrapped in caramel dipped in chocolate have my stomach growling and mouth watering!! I am amazed by the variety of treats and chocolate! The chocolate covered pretzels look wonderful. I am hoping to try and share the incredible prize. I'd like to try the Carmel Pecan Bark. I liked the cake pops! I'd love to try the Hazelnut Pralines! I would love to try the cherry cordials. would love to try the cheesecake ganache!!! I want to try the Carmel Pecan Bark. It's great they support so many organizations. I'd love to try their beautiful signature truffles! I learned about "Brewed Chocolate" and I would LOVE to try it! I might try Dark (72% Coucher du Soliel) Ganache with Dark Couverture. I think chocolate covered oreos sounds awesome! But chocolate covered potato chips is interesting, too! I like that they are involved with so many charitable organization and give back to their community. I would love to try their Chocolate Cremes, OMG they look so good! I'd love to try the Chipotle Chile Dark Ganache with Dark Couverture!! I'd like to try the Extra Large 18" Tray of Chocolate Treats! I'd like to try the cake pops. Would love to try the Carmel pecan bark! I'd love to try their Almond Toffee Bar. I wanna try the Cheesecake Ganache! I'd love to try the Manitou Chai truffle! I'd love to try the Pineapple Gelato. 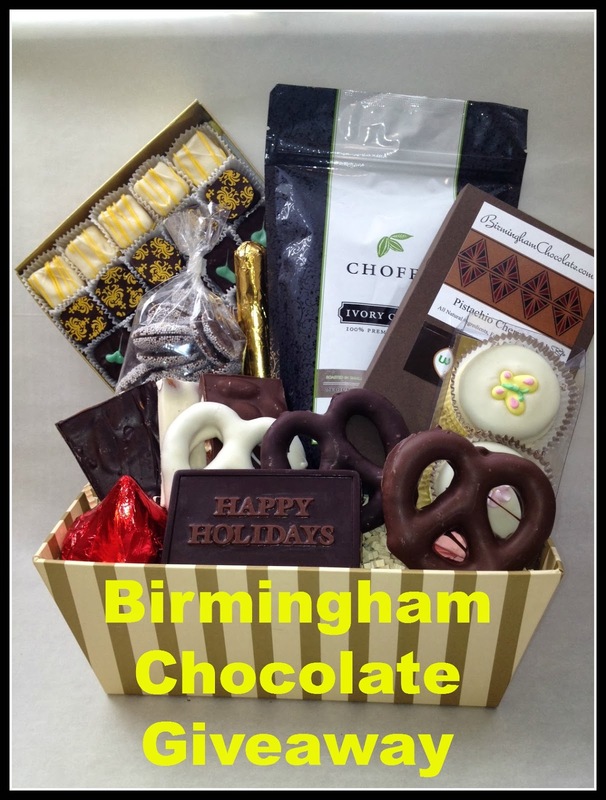 I love that Birmingham Chocolate Company believes in being involved in their community. They state that they are committed to supporting their customers in fund raising for causes that are important to them as much as possible. Would like to try the brewed chocolate. I'd love to try the Macadamia Chai chocolate bar. I would love to try the Almond Sea Salt Semi-sweet Dark Chocolate Bar! I would like to try the Large Truffles Box with Message Bar. Posted a comment on your Orange Creme Brulee recipe. any of those trays of treats would please me! chocolate covered grahams! I want the chocolate covered oreos! Mmmmm. I like that the company gives you options like vegan, gluten free, sugar free, etc. I would love to try the caramel. I love chocolate and caramels! I would love to try the Small 10" Tray of Chocolate Treats. I think my family would appreciate the Extra Large 18" Tray of Chocolate Treats. I want the white chocolate almond bark. I'd like to try the Extra Large Truffles Box. I like that they use "vegan, all natural ingredients, sugar-free, gluten free and kosher and do not add preservatives." They have a vegan option. since Easter is around the corner, the Easter baskets they have look great for gifts especially Easter Basket Medium basket filled with chocolate bunnies! I'd like to try the Hazelnut Praline. Our chocolatiers enjoy personalizing your chocolates, whether for family, friends or business. Plus they are in Michigan I have to bookmark this for a day trip, thanks! I like the Chocolate Dish for Mother's. I learned that the chocolates are made on-site without preservatives. I would like to try the white chocolate oreo bark. I really want to try their white chocolate almond bark! I would like to try the artisan truffles. Love the assortment of chocolate. Oh my goodness. Yummy yummy. yum! That chocolate basket look delicious!